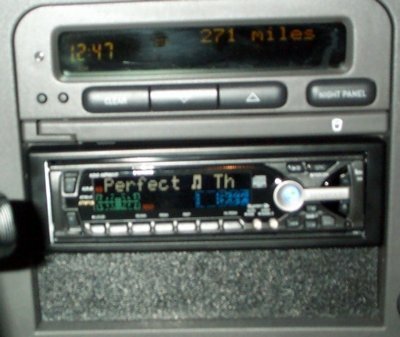 Here are some images of the Kenwood in-dash MP3 system I put in the car. I also put in an Alpine amp. It's actually screw mounted into a thick hard plastic board that mounts in the inside of the spare tire - 100% out of the way and commpletely invisible. There is enough cable so I can move it well out of the way if I need to use the spare tire. I will take a photo of that tonight and add it here. 4 new speakers as well (2 front - 2 rear). The read out displays the song and artist names. Currently playing when I took the photo was Perfect by The The. Faceplate on the in dash unit is easily removed so it doesn't get left in the car/stolen. I plan on getting a piece of gray dash material to go over the black beneath the deck. We called B&B to see if they had any spare material, like from a blown air bag etc. 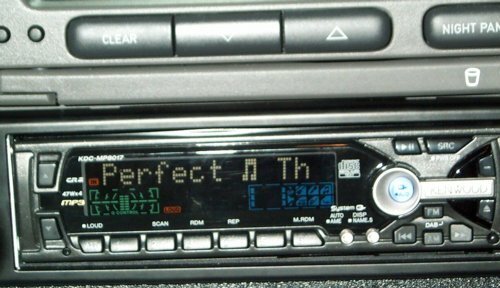 They didn't and when we told them why we wanted it, they told us that we were the first people they ever heard of that had installed an after-market stereo system into a 9-3?!?!. It's by far the best sound system I've owned, in or out of a car. Besides the photos below, check out the playlist from the CD I was using. 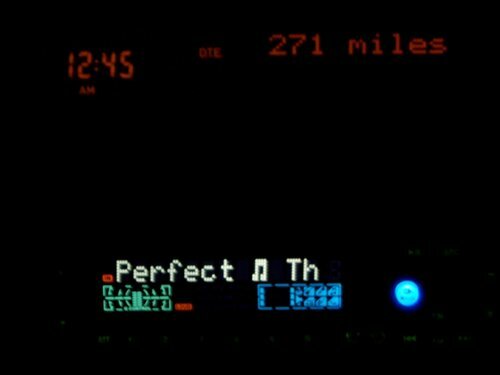 220 songs at 128kpbs taking up 698MB. Update: Someone asked what speakers we upgraded to. A: Boston Accoustics. 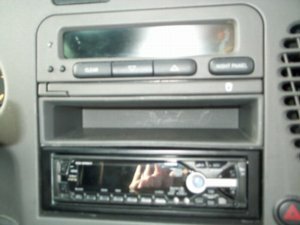 Update - 12/01 - I got the in dash kit from Europe and moved the CD player to the bottom slot with the storage area above. 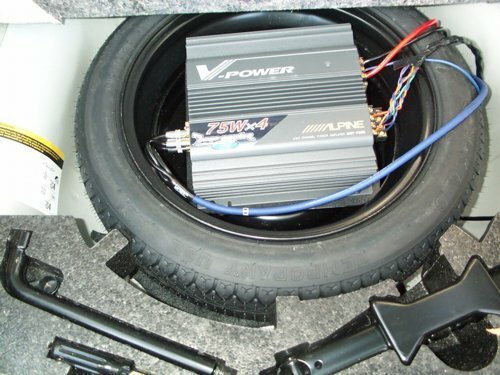 And finally, a photo of the amp nestled in the spare tire. The amp is mounted to a hard piece of plastic cut to fit and sit just in the spare tire. It's snug and doesn't move around. There is plenty of cable to be able to lift up and move the amp out of the way should the spare be needed. The playlist from the CD I was using.